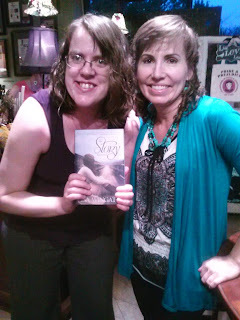 I met Lisa Wingate a couple of years ago when she stopped by FoxTale Book Shoppe on tour for The StoryKeeper. I loved Before We Were Yours and could not wait to dive into this one. Will this be one to check out at the beach? I enjoyed the story of The Storykeeper. I am always intrigued when the author writes about the publishing industry from a fictional perspective. Jen Gibbs story arc is her position of an editor did much to drive the plot. I was not however as much of a fan of the Rand and Sara part of the story. Ms. Wingate did a great job researching the life in Appalachia. I listened to the audiobook. I liked the narrator but her use of a different voice for the male roles was a turn off for me. One theme explored in this story is family. Jen Gibbs family was conflicted due to its past entanglements with a cult. Where Owen’s family was divided by the past as well. Rand was also conflicted due to his family because he could not bring Sarra into his world of wealth and privilege. I loved how each of these characters rose above to step out of their defined roles as established by their families and history. I don’t know that I would have the courage to do the same. To purchase a copy of the recent release of Tending Roses here.